All deaths bring great sadness and impact widely on family and friends. The death of a leader in the community, in this instance, a serving priest within the Diocese, broadens the scope of grief. It is exactly thirty years ago this year since a serving priest of Cork, Cloyne and Ross died in service. Our grief is, of course, as nothing to yours, each of you Adrian’s family and loved ones. Adrian liked tradition. Today we bring him to this place in the traditional way. We place him in the chancel, as a priest, from where he led worship. His coffin faces you, as he faced you, the people of God, Sunday by Sunday. In that leading of worship, Adrian relied on the Book of Common Prayer as members of the Church of Ireland, as Anglicans, do. It is our way. Adrian did things by the book; it’s one of the things we admired in him. As I say, that’s the Church of Ireland – it’s the Anglican Way. In our part of the Christian tradition, the way we worship sets out the way we believe. The Latin phrase is Lex orandi; lex credendi – literally, ‘the law of prayer, is the law of belief’, or more colloquially, ‘the way we pray is the way we believe,’ Sometimes people add on Lex vivendi – the way we live – as we worship, so we will pray, and so we will live. This is the way Adrian lived. One of my abiding memories of Adrian is of him arriving at the Bishop’s drinks reception at the annual clergy conference in Ballylickey and, from my window seat, each year I knew, for sure, Adrian would come to the bar and ask what red wines were available. He would ask to see the bottles before making a choice. Fine wines were one of his interests, but they were far down the list of interests on his enquiry form sent to me when he was thinking of ordination. Right at the very, undisputed, top was family. And we are here to support, comfort and sympathise with you Adrian’s family, and to thank you for sharing him with us through his ministry in the Church. Here, in this part of the world, we know Mary-Rose and Suzie best, but to all of you, all Adrian’s children, Elizabeth, Ludovic, Miranda, Aidan, his grandchildren, sister Hilary (who I’ve known since the early 1980s, long before I ever knew Adrian), brother Derek and all Adrian’s grandchildren, and family circle; and I add today, you the people of Cobh and Glanmire among whom Adrian was serving when he died; to all of you I extend our sympathy. All of these considerable gifts and qualifications, Adrian brought to bear on his ministry, as a lay man – people’s churchwarden and rector’s churchwarden and on the Board of Management of St John the Baptist National School in Midleton, first as treasurer, and then as chairperson. He worked as a consultant to Midleton College. He was methodical, organised, attentive to detail, often serious and cautious, never impulsive, always self-confident, conscientious and diligent. His was a vocation that had a long and persistent gestation. All of these qualities characterised his ministry as a priest among us and alongside us. On St Peter’s Day 2009 – appropriately for a man whose middle name was Peter – Adrian Peter Moran was ordained deacon by me in St Fin Barre’s Cathedral, alongside Patrick Burke and Anne Skuse, and he served his time as a deacon in the parish of St Anne, Shandon. He had done training placements in Templebreedy Group, and in Douglas Union with Frankfield. After Saint Anne’s he served in Fermoy Union (2010-13), in Bandon Union (2013-14) and, since 2014, he has been with you here in Cobh and Glanmire Union as Priest-in-Charge, while always ready to help, if needed, where he could elsewhere in the Diocese. Here it has to be said he has given you fresh strength, new courage and confidence, and done you and us all a great service. As Mary-Rose sat with Adrian in his dying hours last Wednesday, I asked her to send him our love and prayers, and to say thank you from all of us. We have benefited greatly and in so many ways from the friendship and co-working of this interesting and talented man, human, of course, like the rest of us, and vulnerable to an intrinsic part of the human predicament: illness. He dealt with his privately, stoically, optimistically, with great personal dignity, and a lot of privacy. Priests (or presbyters) in the Church of God are called to work with the bishop and with other priests as servants and shepherds among the people to whom they are sent. They are to proclaim the Word of the Lord, to call those who hear to repentance, and in Christ’s name to pronounce absolution and declare the forgiveness of sins. They are to baptize, and to catechize. They are to preside at the celebration of the Holy Communion. They are to lead God’s people in prayer and worship, to intercede for them, to bless them in the name of the Lord, and to teach and encourage them by word and example. They are to minister to the sick and to prepare the dying for their death. They must always set the Good Shepherd before them as the pattern of their calling, caring for the people committed to their charge, and joining with them in a common witness, that the world may come to know God’s glory and love. You have held a baby’s head in the cup of your hand as you have baptised it, you have sometimes been overcome with a sense of the incredible miracle of existence; and the human mystery has opened up onto the divine, or sometimes a young man and woman have stood side by side before you and taken the marriage vows with utter sincerity to God Himself, the human mystery has opened onto the divine. Or you have stood in a hospital ward or some other room of death at the bedside of someone leaving this world and all they love and you have stood with them and those they love, it has been the human mystery opening onto the divine of which you have been conscious, indeed have been overwhelmed by and you have experienced the enormous privilege of ministry. Adrian experienced the enormous privilege of ministry. We experienced the enormous privilege of Adrian’s ministry among us. All that aside, you his family knew him better and best: as husband, as father, as grandfather, as uncle, and as brother. 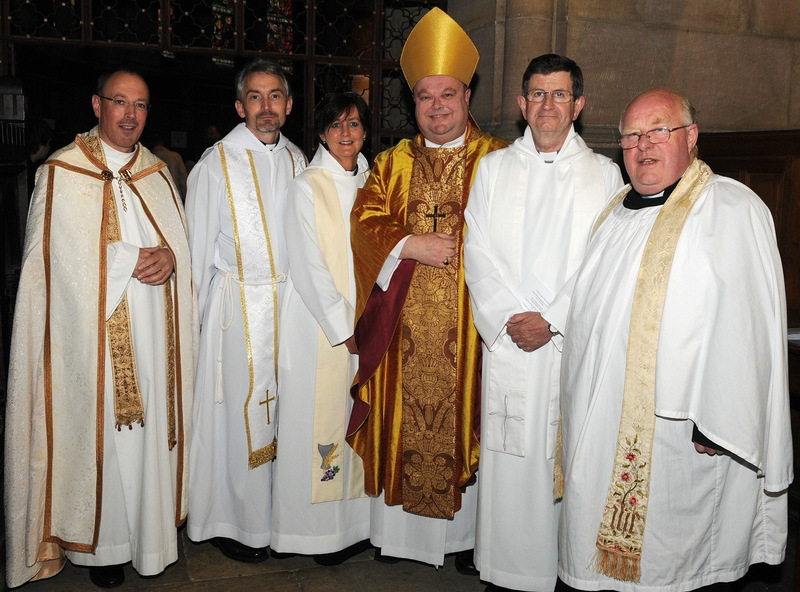 The Reverend Adrian Moran (second from right) at his ordination to the priesthood in St Fin Barre’s Cathedral Cork on the Feast of the Visitation of the Blessed Virgin Mary in 2010 with (l-r) Father Kevin Morris, the Reverend Patrick Burke, the Reverend Anne Skuse, the Bishop, and (right) Archdeacon Robin Bantry White. This entry was posted in Bishop, Clergy, Funeral in the Diocese, Sermons. Bookmark the permalink.